Holiday Wine Sales: That’s Where the Money Goes! Oh boy, that’s where my money goes. I remember learning this tune from a Mitch Miller singalong LP years ago (click here to hear the song). 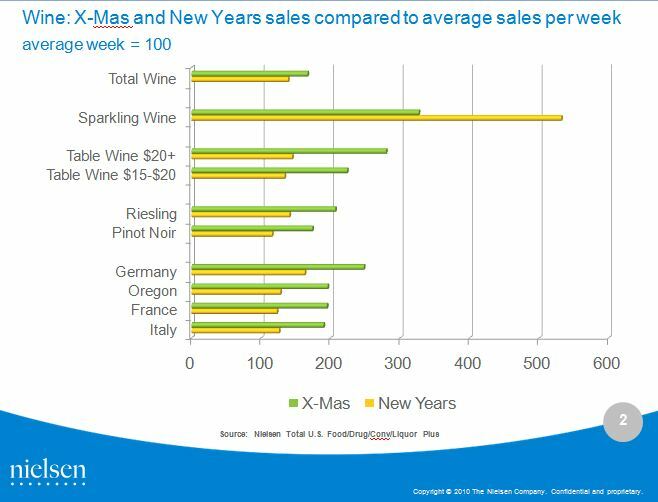 I’ve written new lyrics to highlight a report from Nielsen about holiday wine and spirits sales (see chart above). Wine sales surge around the holidays, but sales don’t increase evenly across the board. Here’s a summary of the findings, courtesy of Danny Brager, VP Beverage/Alcohol Group, Nielsen. And which varieties tend to really shine during the holidays? Rieslings and Pinot Noir lead the way – with sales increases compared to an average week in the year 107% and 74% higher respectively, even more of a jump than the wine category overall. By country, wines from Germany, tied to that Riesling jump, followed by France and Italy exhibit the greatest holiday sales leap compared to an average week, while wines from Oregon pop the most when looking at major U.S. wine producing states. Trading up for the holidays doesn’t surprise me, but I must admit that I would not have predicted surging sales for Riesling and Pinot Noir. Those are actually the wines that I recommend to my students for festive holiday meals (along with bubbles, of course). I guess the word is out! « Illusive Progress in Wine Advertising? Riesling gets a big boost from people buying wine for dinner and having to buy for a grandmother/in-law/random stranger “who doesn’t like wine that much. What’s not too dry?” I hear it all the time. I know among my friends that the Polka Dot Reisling is really popular.